Reaction to Jackson adding LotR references for geeks like me (i.e. The White Council): Mixed. Appreciate the attention to detail/historical accuracy, dislike the irrelevance. Curious to see how he’s going to fit it in as a subplot; not necessarily curious enough to pay to see it. -The Riddle scene. Spot on, A+. Worth the price of admission. -Easy to follow – not nearly as difficult as LotR. Retained “children’s story” structure, mostly. -Characterization. Most characters are two-dimensional. Gandalf seems to be caricature of himself, which is a damn shame. Bilbo is okay. Elrond (and Gollum) are the only ones I believed 100%. -Radagast, who I believe only gets a grand total of two mentions over the whole Hobbit-LotR-Silmarillion complex, is turned into comic relief to introduce a plot point only obliquely referenced in FotR and only once concretely in the Appendices. For an incidental character, they sure did a number on him. -Inability to reconcile style. Silly children’s story with borderline Jim Carrey style choreography? Epic Battle Of Good And Evil? Very confusing alternation of styles. -TOO LONG, too overblown (see previous). I was 100% aware I was watching a movie up until the Riddle scene, which finally drew me in. -TOO LONG. There is absolutely no need to make this movie a trilogy. None. As a standalone movie, the beginning of a story, with no prior knowledge needed, it was Okay. A little long, but easy to follow. Entertaining. On the other hand, as a standalone there were a LOT of unnecessary tie-ins to LotR proper that had nothing to do with The Hobbit the book, making me think it’s meant to be truly appreciated by people like me – people who really know their Middle Earth history/mythology. Because people who haven’t read LotR and the Appendices thoroughly (thoroughly) wouldn’t get the inside jokes (i.e. the opening of the movie, almost verbatim from FotR, and the White Council). In that regard, as a prelude to LotR and as a tie-in to the history of Middle Earth, I’m not pleased. Again, because of style. I don’t care if it is the prelude to LotR and the end of the Third Age, Bilbo had zero knowledge of what he was getting himself into, and as far as anyone is concerned (until Gandalf suspects the ring), it’s just an adventure. A dangerous one, but not the fuse that lit Middle Earth. FINAL REMARKS: This got me through the movie. 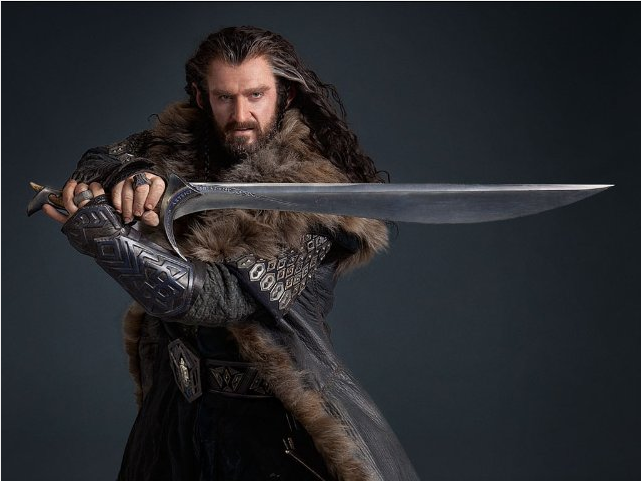 I continue to be pleasantly surprised by this: THORIN OAKENSHIELD: HOTTER THAN EXPECTED.